New pricing schemes, content deals, and technologies are challenging net neutrality. The continued openness of the Internet depends in part on ensuring that Internet businesses treat all traffic in roughly the same way. 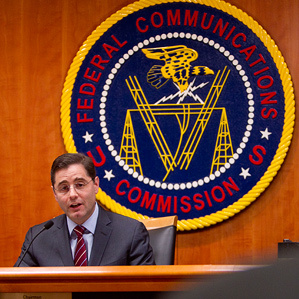 Neutral party: Julius Genachowski, then-chairman of the FCC, speaks during a hearing on net neutrality in Washington, D.C., in 2010. This fall, Verizon will try to persuade a federal judge to throw out U.S. Federal Communications Commission regulations requiring “net neutrality”—the idea that all content and applications must get similar treatment on wired and wireless networks. But even beyond the court fight, the concept is under a diffuse and broad assault. Experts warn that the end of net neutrality would mean that deep-pocketed content providers could squeeze others out. Net neutrality is being eroded on several fronts. New content deals and services are increasingly pushing against the concept. And a crop of emerging wireless routing technologies—ones that prioritize data in sophisticated ways—are challenging the concept that all data packets are equal. The FCC’s rules, adopted in late 2010 and called the Open Internet Order, set the general guidelines. Fixed broadband providers can’t block any lawful content or applications; mobile broadband providers can’t block applications that compete with their video or voice telephony services; and everybody has to reveal network management practices to public and regulatory scrutiny. But brazen efforts to favor one content provider over others are still cropping up. The Wall Street Journal recently reported that ESPN was in talks with Verizon Wireless to exclude the sports network’s content from data caps. Verizon spokeswoman Debi Lewis says the company would not respond to rumors. But AT&T CEO Randall Stephenson, in a talk this month to investors, suggested that this sort of thing would be more likely in the future. He described a scenario in which app developers and content providers might pay for the data used by customers: “There will be players in the ecosystem who are motivated to draw more traffic to their particular content or website. Will models emerge where they are willing to defray some of the consumers’ end-user charges by paying it themselves, either by advertising or by monetization of data? The customer allows them to monetize data? And will there be a sharing of that revenue stream in the ecosystem? I think the answer to that is yes. And I think we aren’t necessarily going to be the driver of that—I believe the content and application developers will be the drivers of that.” AT&T and Comcast did not respond to interview requests. In Europe—which has no continent-wide neutrality regulation and is, of course, not subject to FCC regulation—Germany’s Deutsche Telekom recently announced that it would impose strict data caps on home users’ Internet downloads by 2016—but would exempt its own TV service, called Entertain. In response to that and other measures, a consortium of 80 digital rights organizations in Europe this week called for regulators to crack down on ISPs who it said were “using technical measures for their own commercial interests and tampering with citizens’ ability to access the Internet.” The charges came in a statement Wednesday aimed at the European Commission, which is considering non-binding recommendations to telecom regulators in European nations. More subtle efforts are creating a conundrum. Last year, Comcast said its customers could access its on-demand video using an app on the Xbox 360, explaining that the app is basically the same as another set-top box—in other words, that it’s basically “cable TV”—and therefore isn’t subject to the caps in its Internet service that would apply to competing services such as Netflix. Meanwhile, a crop of new technologies—especially on the wireless side—are creating priority service and policies that allow preferential treatment of some data to content providers who pay extra (see “Akamai’s Plan for a Wireless Data Fast Lane”). How these technologies are deployed will be of growing importance: the portion of data traffic that’s wireless will reach 60 percent by 2014, according to networking giant Cisco. “The move to wireless implies bandwidth scarcity, so that some traffic management based on signal quality and type of service is unavoidable,” adds Dipankar Raychaudhuri, director of the wireless research lab at Rutgers University (see “Can the Wireless Internet be Neutral?”). Wu predicts that market forces will help keep new pricing or throttling regimes from getting out of control. For example, if ISPs try to charge Google to carry its data, Google could charge the ISP for the privilege. For those who think neutrality should be enforced by law, there is some good news. Part of Verizon’s argument is that the FCC simply overstepped its authority in writing the rules at all. Last week, in a separate case involving zoning disputes over cell towers, the U.S. Supreme Court weighed solidly in the FCC’s favor and said the commission could define what its jurisdiction consisted of.